THE launch of Melksham Community Meals at the Assembly Hall has been described as ‘a huge success’ by the organisers. The service launched last week on Friday and Sunday, attracting a total of 68 people across the two sittings. The new service replaces the Melksham Lunch Club, which was axed by Wiltshire Council in December last year after they announced it was not financially viable and was running at a loss of £82,000 a year. Local woman and nominee for Melksham Person of the Year 2018, Sue Mortimer, who led the campaign to reinstall the service, told Melksham News, “It was a great turn out for the start of the Melksham Community Meals at The Assembly Hall on Friday 8th February and Sun 10th February – 30 people attended on Friday and 38 on Sunday. “I was very pleased to recruit the original staff from the lunch club, Elvy Schofield and Sue Hutchinson, as their meals were always a winner with the customers. Thank you to the seven volunteers who helped out over the two days and a massive thank you to Alice (Elvy’s daughter) who is showing us the ropes. At the launch last Friday, Melksham News spoke to former users of the Melksham Lunch Club, Penny Hills, Denise Willis and Sue and Trevor Lawes, to hear their thoughts on the new Melksham Community Meals service. They said, “We are very pleased that the service has come back – we’ve gone quite hungry the last six weeks! “What Sue and the volunteers have done is brilliant, marvellous. When Sue gets her teeth into something there is no stopping her. 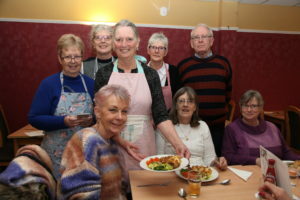 Sue’s campaign to launch Melksham Community Meals – a service open to everyone in the community, offering a place for people to meet and socialise – attracted huge support from the town. Melksham Community Meals at the Assembly Hall runs two days a week – Fridays and Sundays 12pm – 2pm. Upcoming dates for the service are Friday 15th February, Sunday 17th February, Friday 22nd February, and Sunday 24th February. For a full list of upcoming dates and more details, contact Sue Mortimer on 07719 935883. To book call Melksham Assembly Hall on 01225 709887.